Employees have a right to receive equal pay for equal work. Wage discrimination, or discrimination in compensating employees, is against the law. Wage discrimination can mean paying women less than men, paying someone less because of their race or religion, or underpaying an employee with a disability. Wage discrimination is a serious offense. Federal, New York state, and New York City laws protect employees from wage discrimination in the workplace. If you experience wage discrimination at work, a New York discrimination lawyer can help. It is illegal to pay women less than men for the same work. Employers must provide equal pay for equal work. Discriminating against an employee by offering lower wages or benefits violates the law. 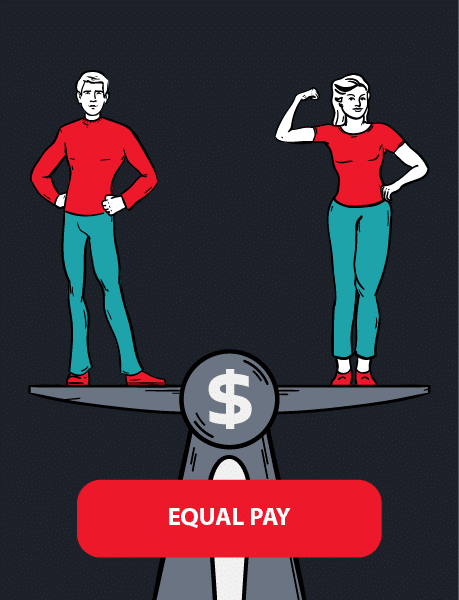 Equal pay laws apply to pay differences based on gender, race, religion, age, or disability. New Yorkers are protected from pay inequity by employers under the Equal Pay Act of 1963 (EPA), Title VII of the Civil Rights Act of 1964 (Title VII), the New York State Human Rights Law (NYSHRL), and the New York City Human Rights Law (CHRL). If you believe that you have been the victim of illegal wage discrimination, you are protected under federal, state, and New York City laws. The Equal Pay Act requires that men and women be paid the same for equal work in the same establishment. The jobs do not need to be identical, but they have to require substantially equal skill, effort, and responsibility, and they have to be performed under similar working conditions within the same establishment. Two people with different job titles may have substantially equal jobs based on the tasks they perform. You worked your way up to the position of regional manager. A male regional manager with similar training and work experience was recently hired, and you learn that he will be paid more than you. Your company’s health insurance policy does not cover your husband, because it is assumed that he will have his own benefits. However, your male coworkers’ wives are all covered by the policy. You are a top salesperson for your company, but your employer reassigns you to a less desirable territory, while a male employee with lower sales is given your territory and client base, enabling him to make much more in commissions than you. You work as a salesperson at a high-end retail store that sells men’s clothing. The male sales staff receives a $12,000 per year clothing allowance. The female sales staff do not. This may violate the Equal Pay Act. It is also illegal to pay someone less because of race, color, religion, national origin, age, or disability. In addition to equal pay laws, the law also protects other groups from wagec discrimination. At the federal level, Title VII, the Age Discrimination in Employment Act of 1967, and the Americans with Disabilities Act of 1990 all prohibit wage discrimination. An employee with a disability receives less pay than co-workers without disabilities who perform the same job. The employer does not provide an explanation for the differential. This is illegal wage discrimination based on disability. A school district hires both cleaners and custodians to take care of the school buildings. Cleaners and custodians perform the same job duties, but custodians are paid higher wages than cleaners. All the cleaners are people of color, and all the custodians are white. The district justifies the higher custodian wages by arguing that custodians must take the civil service exam. Since both positions perform the same job tasks, the fact that custodians have to take the civil service exam does not justify paying them more. When an employee becomes eligible for Social Security retirement benefits, his boss cuts his wages since he will be receiving Social Security. This is illegal wage discrimination based on age. The equal pay laws protects employees from discrimination in any form of compensation, including salary, overtime pay, bonuses, stock options, profit sharing, life insurance, benefits, and vacation or holiday pay. It is illegal for employers to ban employees from discussing their wages with co-workers. Employees are legally allowed to inquire about, discuss, or disclose wages with other employees in order to uncover wage discrimination. However, no employee can be required to discuss wages with another employee. Differences in pay may be legal under particular circumstances. Pay differences must be based on a seniority system, a merit system, a system based on quantity or quality of production, or another valid factor such as education, training, or experience. Under New York City law, it is illegal for employers to ask about an applicant’s salary history during the hiring process. Inquiring about salary history during the hiring process can reinforce salary inequality and create pay inequity in the workplace. This is particularly harmful to women and people of color. Salary negotiations should be based on the applicant’s qualifications and the requirements for the job. If a potential employer has asked for your salary history in job postings, on applications, or in interviews, you can file a claim. If you complain about wage discrimination, it is illegal for your employer to take any action against you. It is illegal for employers to retaliate against applicants or employees who complain about discrimination on the job, file a charge with the Equal Employment Opportunity Commission (EEOC) or any state or city agency, or participate––including being a witness––in an employment discrimination proceeding, such as an investigation or lawsuit. If you choose to file a claim for pay discrimination, you have several options. You can file a complaint with the U.S. Equal Employment Opportunity Commission (EEOC), which handles violations of federal equal pay law. The New York State Division of Human Rights handles NYSHRL violations, and the New York City Commission on Human Rights is responsible for CHRL violations. In cases where your claim falls under multiple laws, the three agencies have what is called a “work-sharing agreement,” which means they cooperate with each other to process your claims. There is no need to file a claim with each agency. You just need to indicate that you want your claim “cross-filed” with the other agencies. Learn how to file a discrimination claim, how to file an EEOC complaint, or contact a New York equal pay lawyer for help.